A white woman and a black man who may live in the Omaha metro are suspects in a series of burglaries in a Des Moines suburb. Officials in central Iowa say the two are suspects in several burglaries that have happened in the Grimes area over the last few weeks. 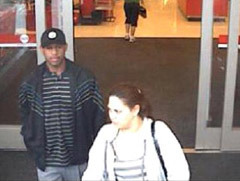 The two were caught on Target store surveillance tape. Officials believe they are driving a rather new red car — a 2008 Impala or Malibu — and they believe the pair lives in the Council Bluffs or Omaha area. The Polk County Sheriff’s office has released photos, asking for the public’s help in tracking down the duo.